When contacting FSBO owners, you may be tempted to convince them of all the reasons why they’re in way over their heads and why they need you as an agent. It’s easy to think they need a mindset shift. But turn your attention inward and make a few changes to your approach, and you’ll be surprised by how many FSBO clients you’ll add. The value of an expert real estate agent is becoming increasingly accepted by home owners. In fact, there has been a downtrend of FSBO sales since 2003. The National Association of Realtors has reported the number of agent-assisted sales has consistently gone up and only 8% of home sales were FSBO sales in 2016. This is due to the intangibles an agent brings to the table, like pricing information, negotiation skills, staging know-how, marketing expertise, and more. Although FSBO sales are down, they’re not gone altogether. There’s still an important share of sellers that you can convert to clients. A FSBO homeowner is choosing to sell their own home because they want to save money and get top dollar. They likely don’t see the value of a real estate agent. You can show them your professional value by following a few simple tips and shifting your mindset. 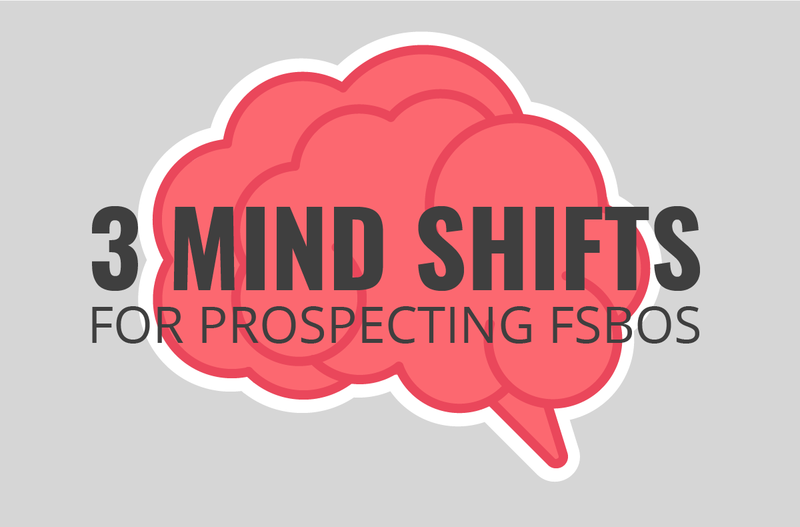 Before pitching your value to potential FSBO clients, we suggest making a slight shift in your mindset and put yourself in their shoes. Consider why sellers think they can be successful listing their home on their own. Have they had success in the past with selling their own home? Do they feel confident in their sales negotiation strategy? Approach each FSBO you talk to with a willingness to learn about them, and you’ll be surprised where the conversation goes. They just might start opening up about their vulnerabilities and where they feel they need help. That’s not your moment to pounce on listing their home. That’s your moment to respectfully acknowledge their legitimate concerns, and then offer helpful solutions and suggestions, even without the expectation of getting client in return. As you resolve concerns and show—not tell—your value as an agent, FSBO homeowners will begin to see on their own your professional value, without you ever having to sell it to them. When FSBO homeowners are approached (endlessly) by agents looking for their business, all they see is a blinking neon sign flashing “Give me 6% commission!” Yes, the commission is great, but there are ways your relationship with FSBOs can be mutual, without ever listing their home. There are tons of great real estate products and subscription services available exclusively to real estate professionals that FSBOs don’t have access to. Offer to help FSBO homeowners using your agent resources, even if they don’t directly list with you. People like genuine people. It’s a trait that is valued because it creates a bond and a connection between people. When you listen more than you speak and create a genuine connection with potential clients, your sincerity will pack a bigger punch than your sales pitch. They won’t likely remember every word you said, but they’ll remember how you made them feel. If an FSBO homeowner can tell that you genuinely want to help them, they will trust you as an agent. That trust is key in helping them make the decision to list with you and will carry on when they refer you to their friends and family members. Creating a connection is the capstone that shows FSBOs your value. When you acknowledge their concerns, and then resolve those concerns by offering genuinely helpful solutions, you’ll create a reputation for yourself that will far precede you as you look to convert more contacts to clients.